Learn more about enhancing the bonding, sealing, coating and potting/encapsulation procedures, as well as general product information. What types of certifications do your adhesives, sealants and coatings meet? E-linking has a variety of polymer compounds that meet stringent specifications and have passed rigorous testing. Many of our systems are NASA low outgassing certified, USP Class VI approved, RoHS compliant, FDA approved and UL 94V-0 certified for flame resistance. Learn more about our product certifications. What pretreatment method do I need to ensure proper bonding of dissimilar metals? Adhesive formulations are available for bonding almost any combination of dissimilar metal surfaces. Special attention must be paid to removal of contaminants such as dirt, oils, greases and extraneous particulates prior to bonding is essential to obtain durable high strength bonding. Mechanical roughening (abrasion) of the surfaces to be bonded is a simple, highly effective pretreatment, even for such difficult to bond metal surfaces as stainless steel or titanium. How can I effectively bond materials with different thermal expansion coefficients? Bonding substrates with widely different thermal expansion coefficients, such as glass and aluminum or plastics and ceramics, can be readily accomplished with properly selected adhesive compositions. Adhesives with compliant bond characteristics are the key for achieving high strength, durable bonds between such substrates. How tight are the bond line tolerances for assuring effective adhesive bonding? Gap filling, solventless adhesive systems such as epoxies, polyurethanes and silicone materials are very tolerant of variations in bond line thickness.E-linkingformulations based on these and other polymer systems can produce high performance bonds with assemblies whose bonding surfaces have tolerances up to 20 mils and even more. Highest strengths are usually achieved when adhesive bonds range from 2-5 mils in thickness. Do you have products formulated to bond polyolefin plastics? We offer adhesive products for bonding polyolefin plastics such as polyethylene and polypropylene. Usually specific surface treatments are employed to optimize bonding of these plastics. Also, special primers are available to enhance adhesion. Do your products resist exposures to ionizing radiation? We offer products that have been specially formulated to successfully resist exposures to ionizing radiation as high as 108 to 1,010 rads. These can be cured at ambient or at elevated temperatures. How much adhesive is required for obtaining durable high strength bonds? The amount of adhesive used to completely fill the gap between the two surfaces to be bonded should suffice. Use of excess adhesive is wasteful and requires an additional clean up operations which further increases costs. How can I prevent excessive flow of an adhesive from a joint? The key to preventing excessive flow of an adhesive from a joint during application and/or cure is to select an adhesive with the proper viscosity for the application. Thicker bond lines or elevated temperature cures generally require adhesives with higher viscosities and thixotropic behavior. Do you offer products which resist cryogenic temperatures? 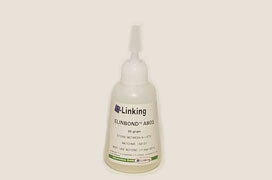 E-linking has a line of products which are presently used, very successfully, for cryogenic applications. They include both two component, room temperature and one part, heat curing systems. Does E-linking offer low outgassing products? We offer quite a number of adhesive products which fully meet NASA’s stringent outgassing requirements. 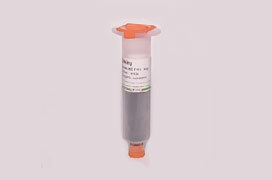 Detailed outgassing test data is available for specific E-linking low outgassing products. They are serviceable at cryogenic temperatures and include high strength, electrically insulative, thermally conductive and electrically conductive systems. Can existing formulations be altered to better meet specific application and performance requirements? E-linking’s experienced technical staff will be glad to work with customers to optimize both application and performance needs for specific assembly applications. We can adjust such variables as viscosity, gel time, curing characteristics as well as lap shear strength, peel strength, flexibility, chemical stability, heat resistance, impact strength, etc. E-linking will keep such customized formulations strictly confidential for its customer. Are E-linking adhesives available in special colors? E-linking can prepare its adhesives in almost any desired color scheme. The specific color concentrates employed by E-linking do not affect pertinent processing and performance parameters. Learn more about our color options. Does your product line offer UV curing potting and encapsulation compounds? E-linking offers both rigid and flexible UV curing compositions for potting and encapsulation. They offer exceptionally fast cures, superior physical strength properties, good chemical resistance and dimensional stability. Cures can be readily effected in section thicknesses up to 1/4 inch and more with commercially marketed UV lamp equipment.